Here's a move that marks yet another important step in Chinas goal of greater participation in the global financial markets. Investors are starting to gear up for the October debut of the Shanghai-Hong Kong Connect (or “Through Train,” as it is commonly known), a move that marks yet another important step in China’s goal of greater participation in the global financial markets. China is arguably the most important player in the global economy and yet its financial markets have remained relatively closed to foreign investment. Chinese investors, too, have to date had limited investment possibilities, but this latest move aims to break down the barriers between the Hong Kong and Shanghai bourses, thereby allowing investors from both mainland China and Hong Kong, as well as investors from overseas, greater stock selection and increased investment opportunities. The investment universe for the “Through Train” includes 568 Shanghai listed A-shares and 266 Hong Kong stocks—all of which are relatively large and liquid, Henry Zhang, portfolio manager at Matthews Asia, wrote in a recent update. The aggregate quota for overseas investors is set at RMB300 billion (or about $49 billion), while the quota cap for domestic investors is RMB 250 billion (or $41 billion). That said, “given the total capitalization of about $2.7 trillion for China’s domestic stock markets and about $3.1 trillion for the Hong Kong-listed stocks, the through train’s initial impact on the markets as a whole may be fairly incremental,” Zhang said. Nevertheless, the program will offer foreign investors the possibility to directly buy unique mainland China stocks, many of which are large, blue chip companies currently trading at a discount to Hong Kong stocks, that they have not had easy access to in the past, said Frederick Jiang, manager of the Ivy Emerging Markets Equity Fund, thereby increasing their ability to participate to a greater extent in the underlying dynamics that are driving the Chinese economy forward. Jiang cites companies such as Kweichou Moutai, a Chinese luxury brand that has been manufacturing premium, high-end alcohol for hundreds of years. Bottles retail for around $150 to $200 a piece and it’s almost impossible to find them outside China, he said. “Kewichou Moutai’s stock trades at 11 times price-to-earnings and pays 4%-5% in dividend yields,” he said. The same goes for Shanghai Auto, a 50% joint venture between Volkswagen and General Motors, and another attractive mainland China name. That stock is currently paying 8% in dividend yields and is “generating lots of cash flow,” Jiang said. While many foreign investors have been able to invest in these and other names to a certain extent through either the Chinese government’s Qualified Foreign Institutional Investor (QFII) or the Renminbi Qualified Foreign Institutional Investor (RQFII) schemes, the red tape associated with both has been quite onerous, not to mention both costly and time consuming for the limited market participation they allowed, Jiang said. “Now, investors will be able to participate much more directly in one of the world’s largest markets,” he said. 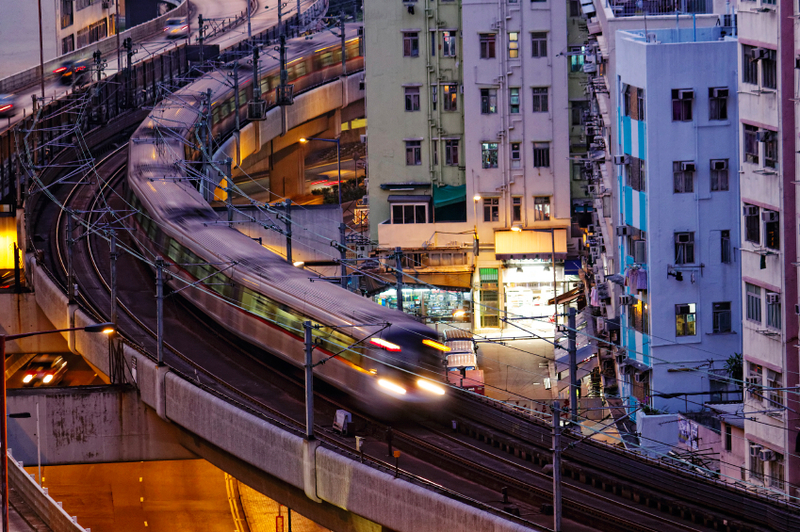 The “Through Train” is also likely to narrow the valuation differential that currently exists between Hong Kong and mainland China stocks, said Jim Oberweis, president of Oberweis Asset Management and manager of the Oberweis China Opportunities Fund. Historically, both sets of shares have traded at different valuations, even in the case of companies that are listed on both the Shanghai and Hong Kong exchanges, Oberweis said, so the “Through Train opens up more possibilities for arbitrage.” Most importantly, though, Oberweis also believes it increases the possibilities for China to take up a greater share of the emerging market indices, “and this would have a real profound meaning for China ETFs,” he said. But greater index inclusion isn’t something that’s likely to happen overnight, not least because a sudden increase in the China segment of the indices could cause a great deal of global market volatility, Jiang said. The extent to which foreign investors will buy Chinese stocks also remains to be seen. While some are no doubt likely to be attracted by blue chip names that are trading at a discount and that they’ve only had limited access to in the past, the Shanghai exchange is largely made up of banking and insurance company stocks, as well as “cement and aluminum companies”, the kinds of companies, Jiang said, that are not particularly attractive to many foreign investors. Also, there are numerous kinks that need to be ironed out as the “Through Train” gets going, particularly those of capital gains tax as it relates to foreign investors and compliance, Jiang said.